There are so many options for stunning centerpieces that it might be difficult to settle on just one. 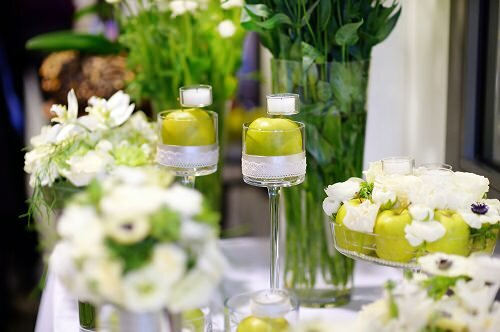 You can opt for traditional floral arrangements, or you can come up with creative ways to add beauty to your emerald-themed wedding. Green vases filled with Easter lilies offer a simple, understated way to decorate your tables. Smaller green vases or glassware can hold tea light candles that make the color of the glass dance and sparkle at each table.